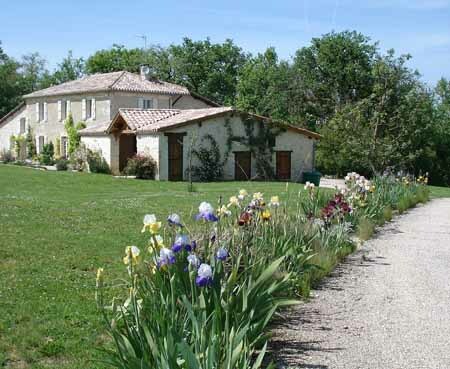 Rose Voelcker, who comes from Hampshire, is selling her beautiful stone house in Fleurance, which is near Auch in Gascony, south west France. She looking for a new challenge, but over the last seven years has made her garden as lovely as the one she left behind in England. Mrs Voelcker is a member of the Royal Horticultural Society and secretary of the Lily Association part of the RHS and has managed to recreate a beautiful English garden in the heart of France with roses, lavender lilies, peonies, pinks and grasses. ‘She has managed to do this because the soil is well drained and there is enough rain to keep the plants thriving,’ says Ian Purslow of Purslow’s Gascony who is selling the property. ‘She also has a Hartley Botanic greenhouse which is used mainly for over wintering plants and starting seedlings off. According to Mr Puslow, keen gardeners in Gascony can join any one of a number of garden societies, which have annual plant sales and a new book, Jardins Secrets de Gascogne, has recently been published, covering 28 private gardens in Gascony, which featured several English owned properties. The property, which is in a lovely hideaway position down a 600 metre lane, has four bedrooms, two reception rooms and three bathrooms. The house has a new roof, electrics and plumbing, flooring is either timber boards or terracotta tiles and it has a fabulous 12 metre living room with painted beams running across the width of the house. In the 4.2 hectare grounds there is a stone barn, which could be converted, garden sheds made from former pigsties, and a greenhouse. The surrounding the property are fields of wildflowers and oak woods.